I have to admit, although I always hear rave reviews about slow cookers (Mrs Thrifty is always sharing the slow cooker love), I don't use ours as often as I would like but I am always on the lookout for new recipes. In theory I should be all over the 'throw it all in and let it bubble away' method of cooking but I have always been a bit paranoid of leaving it all day (despite it being perfectly safe) so I only tend to use ours when one of us is around. This sausage casserole recipe came about (no jokes please!) due to a long day working from home and it was absolutely delicious! The best bit is, this would taste equally delicious with vegetarian sausages or even without any meat whatsoever... This takes between 6 and 8 hours to cook so make sure it is on by 10.00 if you want to eat at 6.00 pm! 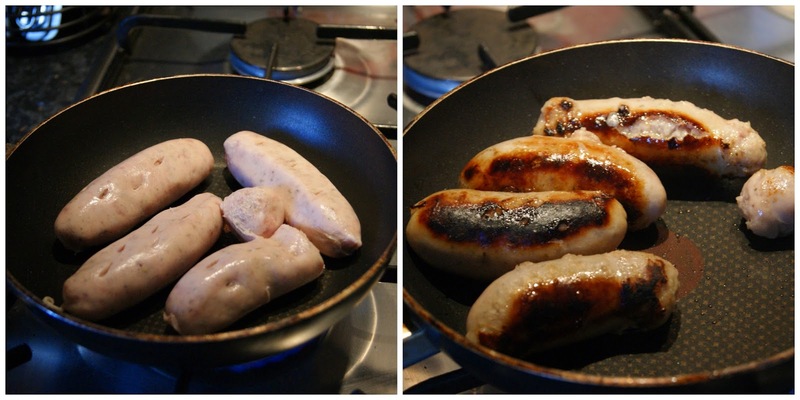 Stab your sausages (ouch) and sear in a hot pan until they are browned. It is very difficult to make raw meat look appealing so I apologies to those of you that are squeamish! Chop up your potatoes into small chucks and cover the base of your slow cooker. Add the chickpeas with your sliced red onion to the potatoes in your cooker. The best bit is just adding layers of delicious veg and pulses to your slow cooker, it looks so healthy! Add your liquid mixture to the slow cooker and ensure it covers the entire pan. Although this doesn't look like enough liquid, try and resist the temptation to add more as otherwise you end up with a very runny sauce! Turn onto high and leave to cook- warning, this will smell absolutely delicious so you will want to eat it ight away! Serve in a deep bowl with some crusty bread and enjoy! I don't have a slow cooker but I do like a good sausage ca\sserole and it's a guide camp favourite, with veggie sausages so that everyone can eat it. Wow can I come round for dinner please Maria? This meal is right up my street, it looks soooo tasty! This looks soo yummy! And anything that I don't really have to stand around cooking is a huge bonus in my book! ;) I am definitely going to have to try this with vegetarian sausages.